It’s just AMAZING!!! 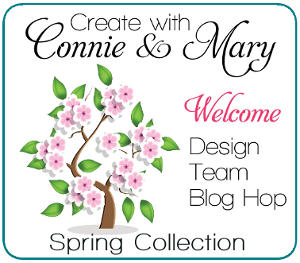 We have come to the end of Week 3 for Create with Connie and Mary Spring Collections 2015! This past week was all about cards so our blog hop today is going to be a little different…each designer will share a small favor to go along with the stamp set we used for our cards. If you are going forward through the hop you arrived here from my friend and partner Connie Babbert and her Inkspired Treasures blog. Connie just LOVES doing little things like this and she is sooooo good! I have to say…I LOVED making my little favor but I had a devil of a time getting a picture of it! I think the Bermuda Bay Sequin Trim being so shiny is what caused the problem! But seriously…this is just sooo quick and easy. Okay…it’s quick and easy if all you have to do is make the cone because ALL THE OTHER PIECES were done and sitting on top of your desk from other things you were doing! LOL!!! 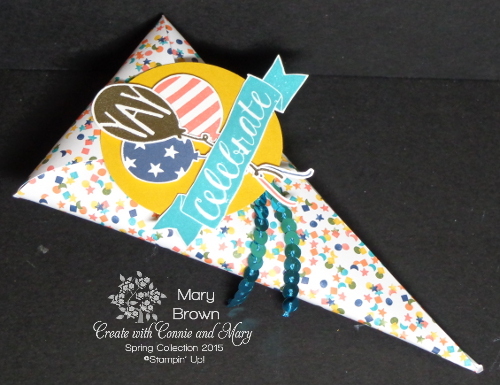 Confetti print (Birthday Bash dsp) – 6 x 6. Fold into a cone then fold done the top flap. You could always leave that up and the it would hold more treats! Stamp balloons on Whisper White: Striped/Calypso Coral, Stars/Night of Navy, YAY/versamark and gold embossed. Cut out. Stamp celebrate banner on Whisper White, cut out. Layer all stamped pieces together and add to 2 1/2″ Crushed Curry circle using dimensionals. Add Bermuda Bay Sequin Trim behind circle and add to cone favor. It’s that just FUN? SOOOOO easy to make and great for so many occasions! 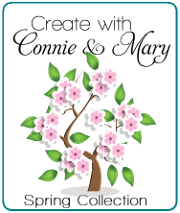 We just finished up week 3 of Create with Connie and Mary Spring Collection 2015 – and it’s still a GREAT time to subscribe! Our subscription is full of gift ideas, home decor, card sets and 3D project tutorials perfect for your stamp camps and classes! We’re using Occasions and Sale-A-Bration products from Stampin’ Up!’s Catalogs. Get over 24 projects for only $29.95 US…that’s just a little over $1 per tutorial! More details over on Create with Connie and Mary! This entry was posted in 3D, Create with Connie and Mary, Spring Mini and tagged Balloon Bash. Bookmark the permalink. This is such a great idea Mary, I love it! !